This is an article about two businessmen in Florida who have "taken the dare" and placed Choose Life license plates on all their company vehicles. If your state has the Choose Life license plate, I suggest you publicize the businessmen and women in your state that have done the same thing. What does the 55 mean to you? After a recent meeting Jill and I had, it will always mean "commitment" to us. 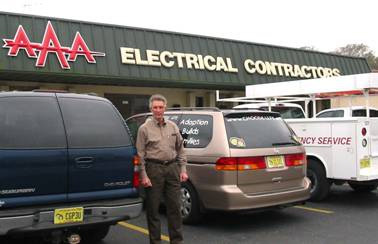 Dennis Brown is the soft spoken president of AAA Electrical Contractors, Inc. started by his father in 1968. Dennis joined the company in 1975 after graduating from Auburn University. He is an active member at First Baptist Church of New Port Richey, married with three children he is very proud of and has worked hard to make his business grow, providing employment for 65 men and women. He sounds like one of any number of successful businessmen in Florida. But let me tell you the rest of the story. After the Choose Life license plate was approved in Florida in August 2000, Dennis decided these plates were a great way to promote what he believes. He said Christians should be willing to speak up for their convictions and vote their beliefs. So he placed a Choose Life license plate on all 55 vehicles his company owned. He said, "I am the type of guy who sends out Christmas cards, not Seasons Greetings. I asked him if it crossed his mind that he may lose some of his business by taking this stand and he said, "I decided if I lost business over the plate, it was probably business I didn"t need; but my business has actually grown and I give God all the credit." Commitment comes in many sizes! Bob Billa owns a small plumbing company out of southeast Hillsborough County and he is also committed to the Choose Life license plate. I stopped by a construction site when I saw the Choose Life license plate on one of his plumbing trucks. I asked him most of the same questions I had asked Dennis Brown and actually received most of the same answers. However, when I asked him why he was pro-life, he introduced me to his 29 year old son Matt who was working on the site and then told me an incredible story of the healing power of God"s love. The story "A Mother"s Story of Mercy"s Healing Power" "How an extraordinary boy trapped inside a very challenging body grew into a young man of faith" has been printed in the Spring 2006 edition of Marian Helper http://www.marian.org/bulletin/issues/spring2006.pdf. Bob later sent me a copy of the magazine and as I read the story by his wife Joley, I cried and began to realized why Bob and his family are so strongly pro-life. Here is a short excerpt from the story. "A neurological specialist told us that Matt had been dropped on the floor at birth. The damage was irreversible and massive"As a result, our son now had cerebral palsy, moebius syndrome, and a mind that would function well below a trainable lever. The outcome was that Matt was forever damaged. He would never crawl, walk, talk, or leave a wheel chair. The experts strongly insisted that we institutionalize Matt." Joley said, "No one has the right to deny another human being life, no matter how challenging"" "I believe with all my heart that every cross will end in glory for those who trust the Lord." "You may be tempted to think, wow, that kid was lucky to have those parents. But I assure you that every human being ever conceived is special and priceless." I shared these two stories to encourage my readers and to challenge other businessmen and women to "take the dare" and show their commitment to life by placing a Choose Life license plate on all their business vehicles. Choose Life, Inc. will pay $20 of the first year"s cost of switching and get the plate for you by mail. For information, go to http://www.flchoose-life.org/. Choose Life America, Inc. is an IRC 501(c)(3) organization and donations are tax deductible. Contributions and profits from the sale of promotional items are used to help Choose Life America, Inc. promote the sale of the real Choose Life License Plate which raises funds to support adoption efforts of Crisis Pregnancy Centers, Maternity Homes and not-for-profit adoption agencies. Please consider supporting us. Everyone is a volunteer; no salaries are paid to anyone. ©2019, Choose Life America, Inc.